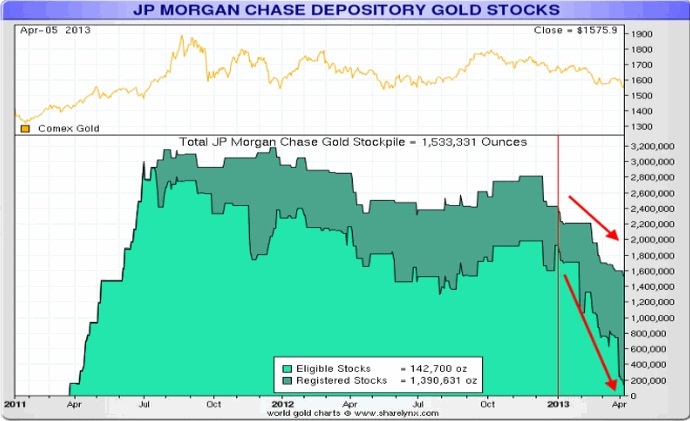 There’s been a recent huge draw down of physical gold at the New York COMEX and at the JP Morgan Chase depository. Look at the physical market draw down on the charts below. It has taken a drastic plunge. You can imagine the dilemma this is causing for the market interests behind these inventories. If the inventory runs out and one cannot meet deliveries then it has to be bought on the open market. Not only that but it could cause a run up in prices that would hurt the shorts in the market. The only way out of this dilemma for the market controllers would be to devise a plan that would collapse the market and trip up all the stops at the correction lows in gold of 1525 thereby setting off the stop loss orders under this important market low. And what if the plan included a way to stop the physical market from purchasing gold under 1525 while that correction was underway? That would be brilliant. And how can that happen? They have to hatch a plan and carefully orchestrate it in a series of events that takes the gold market by completely by surprise and force players out of their long positions. Read on for today’s lesson in market manipulation and allow me to relay my speculation about what transpired last week. A successful ambush usually involves surprise. And the surprise requires a carefully orchestrated setup. So now let’s get a look at how the crash was prepared. The FOMC minutes from the last meeting were due for release during last week. But a funny thing happened. They got released EARLIER than expected. It was all a big mistake and the FED let the SEC and the CFTC know right away that the error had occurred. And lo and behold, despite the FED’s transparency and newly crafted reputation for delivering timely and accurate reports, there happened to be some language we didn’t get updated on until the FOMC minutes were released. The notes say that several members have been discussing cutting back on the stimulus. That was strike one. It got the gold market thinking that stimulus cuts might be coming. Strike one called by the umpire. A bombshell was released from news sources. It was reported that Cyprus would have to sell 400 million Euro’s of gold as part of the bailout package of raising money for their failed banking system. Gold prices came down to 1550 on the news and the day passed by. Even though Cyprus bankers tell us the next day that they didn't discuss selling any gold, market jitters remained with Friday just around the corner. Now we need a strike three and you’re out. Gold is a nervous market to begin with as a lot of people have already lost a lot of money in the last six months. 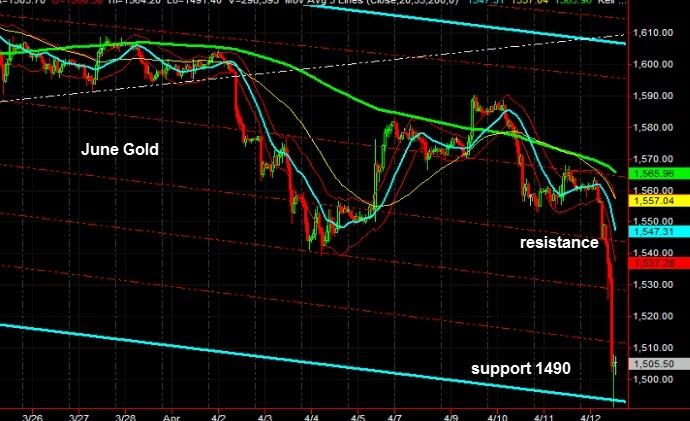 With Gold at 1550, all that is needed for the market to drop is to get one more push where all the stops are. This price level was just below the 2 year low of 1525. With the setup in place the final pitch was ready to be delivered. Selling began in the Friday sessions overseas. By time we got to the New York COMEX gold open, price was down to 1542. Now all the players were on the scene, in the game and ready with volume and liquidity to create the final blow to the gold market. Then the attack began. Wave after wave of selling pummeled gold until it got to 1525. Then the break down of price below the two year low and all the stops that have been accumulating there start getting executed. Selling then accelerates as it begins to feed on itself. The physical market for gold sees this massive stop loss explosion as a gift and gets ready to make their move to buy up the gold on the cheap. Now comes the part that is pure genius or a total coincidental thing that just so happens to be a gift to those who are short the market and those who would be responsible to deliver gold should the inventory deplete. ALL OF A SUDDEN THE LONDON PHYSICAL PLATFORM THAT BUYS AND SELLS PHYSICAL GOLD GETS LOCKED UP. THE SYSTEM FREEZES. No one can get to the physical market to buy at these low prices but at the same time, they can’t sell or protect their positions either. The system is frozen. Yes, just like at Bit-coin. The system locks up. And of course the results are going to be the same, just on a lower percentage level. What can the physical holders do? Meanwhile the futures market continues to drop. So what happens? The physical market holders begin to panic. How can they protect themselves as they can’t sell either? There is only one solution, especially during a panic. Short and ask questions later. Therefore it is my speculation that based on 350,000 contracts sold on Friday and the massive drop in price; some of those contracts were a result of the physical market having no choice but to enter into the futures markets to hedge their physical position holdings by selling contracts or shorting the market. Their choice was either this solution, or wait until Monday and be subject to potentially heavy losses should margin calls go out over the weekend. With no time to think and survival instinct kicking in, the physical holders most likely did what they could to protect themselves. They went in and shorted the futures market. At this point the market goes into a free fall as the physical market can’t buy at these low prices because the computer system is down; they can only sell futures to hedge their long physical holdings and so they do what they have to and begin selling futures. Now it gets worse. As the price drops even more, underfunded players are getting wiped out and now they begin to liquidate. The market goes into a total collapse as all the stops below 1500 get tripped up and the market tanks to 1490. The market finally closes in New York and returns to the 1500 area. But it’s not over. There's another situation going on. The weekend is arriving and players begin wondering about margin calls. How are holders going to get money to their brokers over the weekend for the Monday trade session? But there is not enough liquidity as the COMEX has closed and only the aftermarket GLOBEX is there to execute trades. Without a doubt, the shorts know exactly what is about to transpire. As the market players begin to work this out in their mind there is only one thing left to do. Try and exit and get out in the Globex market. So the selling begins again. The market hits below 1500 and then 1490 get broken. The market sells as much as it can up until the very last minute of trade at 5PM New York time. Even then it’s not over. For some reason the volume and the price keeps moving. Was there special consideration going on for those connected who wanted out? I don't know. But at 5:07 PM Eastern standard time the market closes at 352,248 contracts and a price of 1476.10 down a whopping 5.67% -88.80 dollars. The banks and brokers are open all weekend and as long as it takes to go through all the accounts and issue all the MARGIN calls. If they get the margin calls out by Saturday, the customers have 24 hours to get more money to their brokers. If the money is not received by Sunday night or Monday morning, the positions will have to be liquidated, just when the market is at its lowest liquidity and the longs have had all weekend to think about it and the media has had time to tell everyone that the bull market in gold is over. I hope you understand the picture of how the control boyz forced a major sell off. I speculate the panic over low gold inventory had someone hatch a plan to save their accounts and a lot that was at stake for them. The plot began with leaked information with explosive potential changes in USA policy, and continued with published information that Europe/Cyprus would have to sell 400 million Euro's of physical gold. Finally, once the sell-off began the physical gold market platform in London locks up and no one has buy or sell access in the physical spot market. Did the control boys lock down the physical market platform or was it pure coincidence? Either way they have total plausible deniability. HOW? The computer system went down. It couldn’t handle the traffic and it shut down or a glitch happened in the server. It can be any one of many reasons. This exact same thing happened during the last take down of gold in late December 2011. VOILA. The perfect excuse and the perfect scenario. The physical markets couldn’t buy at those low prices. Let me repeat that. The physical markets couldn’t buy. They could only sell futures to hedge their physical gold positions. Of course this will all be reported on the news and in the financials right? None of it will be reported as none of it was reported on Dec 29th, 2011 when the control boyz did the same thing and locked out the computer and left the physical market holding the bag. Not one word hit the papers. Most people are not even aware that the physical market is run by computers. They have never considered or thought about how the physical market works and executes. Guess what folks? It works the same way as Futures via computers and programs. How do you think it works? Did you think that people show up with all their gold at an auction house and buying and bidding goes on with a mediator who can speak two hundred words a minute and gold is auctioned off like rugs or art? No it runs off a computer system. How do I know all of this happened on Friday? Because I was in direct contact with a big physical dealer out of the mid-east as it was happening. They took the time to explain the physical market to me - how the physical dealers get SHUT out of the game --- as happened before during the last panic (and physical shortage) in Dec of 2011. Here is the screen shot of the actual physical market in action from January 4th 2012 that the physical trader sent me. There's a term for this manipulative tactic in the trading world. It's called "Beat the Beehive." You smash the nest and then watch the total confusion feed on itself. By the next day all the bees are gone and all that's left is a smashed up beehive. There has been a lot of speculation on the markets and manipulation that is going on. What I’ve offered in this report using the fact that gold crashed on Friday is a scenario on how it could have been orchestrated. I leave it to the reader to pass judgment on the potential. At 8:33 AM Friday morning with gold just beginning to trade, GoldTrends listed a potential for $1490 on twitter if $1525 was taken out. 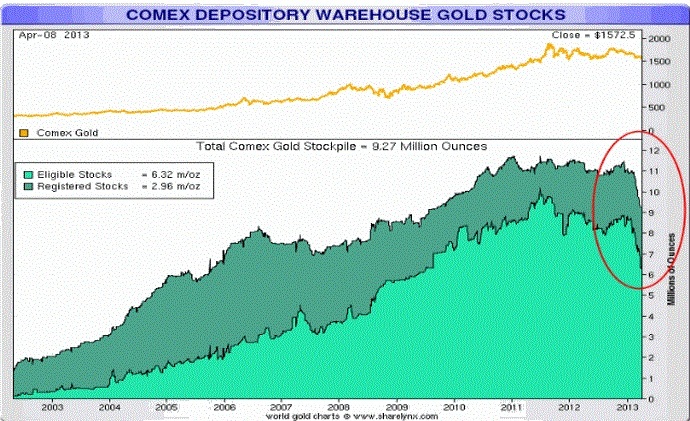 Here is the chart of the COMEX session. Note the low. That blue channel line was what we based our projection potential on. The rest as they say is history. I will be assessing the damage over the weekend. If there really is a shortage then there will be clues that should show up that should show up in the physical markets. We will be on the watch for them if they develop. If we see these clues we will advise subscribers as they develop. The last system lock out was on December 29, 2011. The clues showed up then and a 270 dollar rally took place from 1525 to 1795 by February 29th. Interestingly on Feb 29th, gold fell 100 dollars an ounce on a Bernanke announcement that the Fed was considering slowing down on QE. Let me say this. IF the Feds were to slow down on QE the entire system would collapse in a major deflationary spiral. In a speech two months ago at a college Mr. Bernanke admitted that the FED always tries to "talk" control or what they want to see happen. When that doesn't work they expand to other more important methods of policy. There are only two things that can bring gold down; a manipulated event like we just saw or a liquidity squeeze like we saw in 2008 where an immediate need for cash forced the liquidation of all assets. Yes, but this time it would be on a global scale and much more powerful than the Lehman crisis of 2008. While many think a sovereign default would create an inflationary spiral, it’s the opposite that could happen. A default would result in liquidation and 99 cents out of every dollar in the banking system has been lent out. The need for cold hard cash would be enormous and the only way to get it to avoid leverage margin calls would be to sell assets at a low enough price to attract immediate cash. That is what happened in 2008. With one penny in banks and 99 cents of debt a spiral the other way could develop. But you say the FEDS could print the money. Would they have time? Once a deflationary collapse takes place, then a HYPER INFLATIONARY event can take place. But this is all for another report. Stay tuned as it's probably going to get real interesting. We are now at a critical juncture in gold’s 21st century bull market. 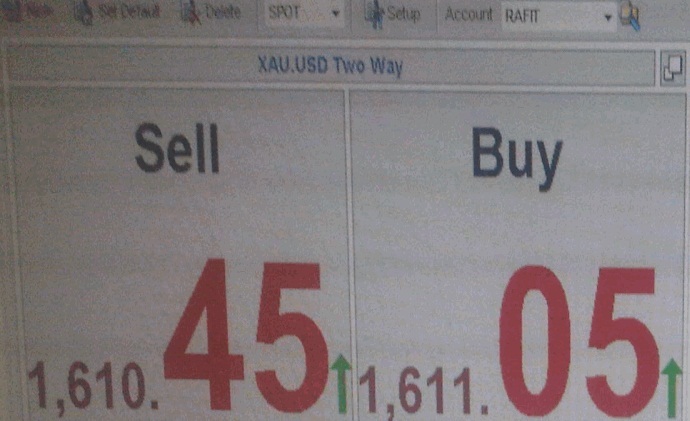 At www.GoldTrends.net we monitor the price patterns on an hourly, daily, weekly and monthly basis. We offer commentary on what it all means along with support and resistance levels along the way in advance of each day’s trade. If you would like to join us for 30 days we offer a free trial. Visit our website home page for details. We’d like you to join us and try us out. Bill Downey is an independent investor/ trader involved with the study of the Gold and Silver markets since the mid 1980s. He writes articles for public distribution for other websites, has been published in Futures Magazine as well as his own website at http://www.goldtrends.net/.